Was Carlos Gardel a grifter? A criminal investigation suggests that the changes of identity and places of birth were done to evade his police record. His scam was “el cuento del tio” which takes advantage of people’s trust and ambition of easily getting great benefits. 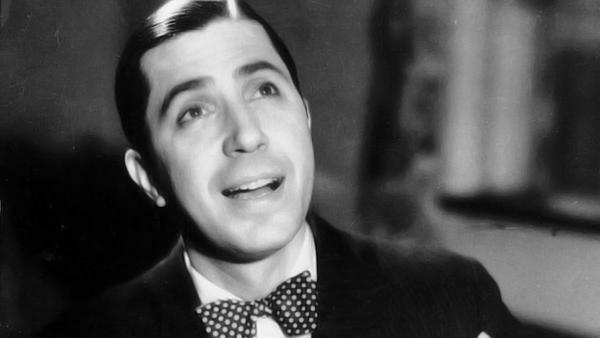 Carlos Gardel was a grifter. This is the conclusion from a comparative study of fingerprints that leaves no room for doubt: before being established as a singer, Gardel lived off the money he got from the victims who fell into his cuento del tio, a swindle that was quite common at the time. Typically a person would go to a bar for several weeks claiming to have had received a multimillion dollar inheritance from a relative, an uncle, for example, who lived far away from Argentina, but lamenting that he had no money to pay for the fare. He would con someone into entering in some sort of agreement that stipulated that the scammer would cede part of his heritage in return for the scammed paying for travel, accommodations and sometimes attorney fees. The copia obtained by Pagina/12 (no one knows who has the original) is dated August 18, 1915 and it is a great discovery: Gardel had his rap sheet destroyed by order of President Marcelo T. Alvear, but someone managed to save two in the province of Buenos Aires, the one shown above and one from 1904, when Gardel was a kid and fled home. 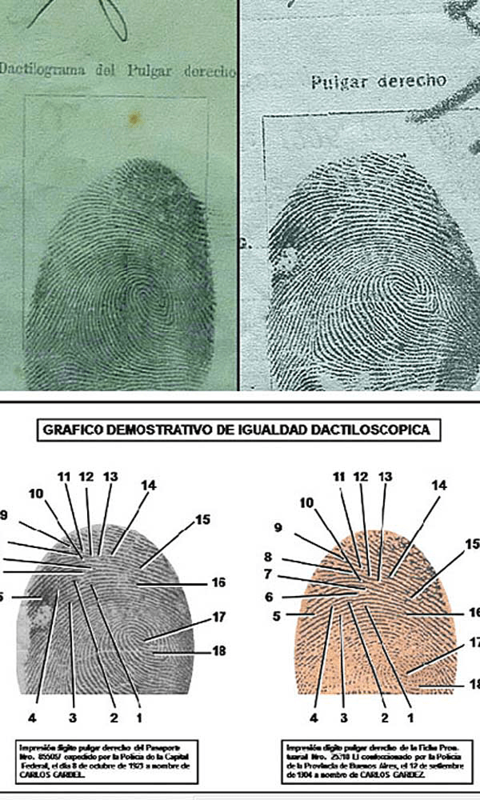 Forensics Raúl Torre and Juan José Fenoglio determined that the fingerprints were from the same person. Even more significant is the fact that in 1904, when he run away from home and his mother was looking for him there was no reason for lying when she identify him as Carlos Gardez, born in 1990 in Toulouse, France. 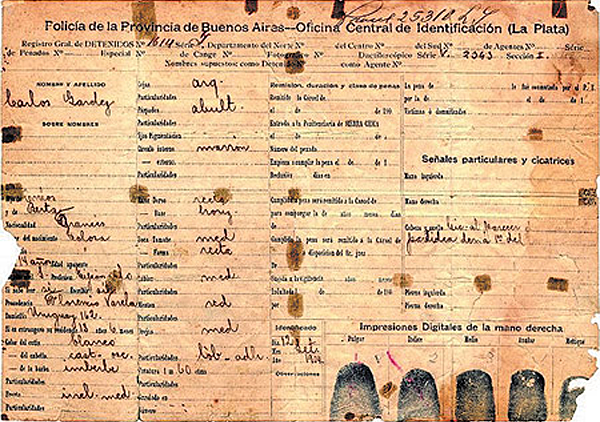 Torre and Fenoglio compared the fingerprints of the run away from home kid in 1904, the 1915 police records and a 1923 passport, apparent from men of different ages, different parents and born in different places. The work was done in the Department of Forensic Science and processed in the AFIS, Automated Fingerprints Identification System. This software converts the fingerprint into a three-dimensional shape and makes the comparison. It is impossible to find two people with the same fingerprints. The computer established that the fingerprints were an absolute match. To further their findings, Torre and Fenoglio did ​​a manual matching process , which verified the existence of 18 characteristic points in all fingerprints. In jurisprudence only 12 matches are required for a result on an individual’s identity to be unquestionable. It’s well documented that a very young Gardel sang at conservative party headquarters in the neighborhood of Avellaneda, one of the most important production centers of Argentina at the time. Raúl Torre relates that Gardel was close to Juan Ruggiero, a bully on the conservative party’s payroll. The party boss was Conservative leader Alberto Barceló. It is said that in 1922 Barcelo prompted President Marcelo T. de Alvear to take care of Gardel police records. And, at the request of the President, the Federal Police got rid of the singer’s arrest records. The Federal police also asked the province of Buenos Aires police to destroy Gardel‘s records, but it seems that a copy was saved. Another curious fact emerges from much of the first songs sung by Gardel. Its author was Andrés Cepeda, who was called “the poet of the prison.” Cepeda spent many years of his life in prison and ended up dying in a knife fight on the downtown porteño. He wrote numerous lyrics for the Gardel-Razzano duo. In medical records reviewed by Torre, Cepeda was also listed as a scammer of the Uncle story variety. Everything suggests that Cepeda and Gardel shared escapades. One hypothesis suggest that they may have shared prison or detention in police stations. Torre says that at that time they clearly segretated offenders in prisons. There were those who committed crimes with guns, known as the “heavy ones”, because they were carrying a .45, a heavy weapon at the time. And the “light ones” who were grifters, scammers and con artists. This suggests that Cepeda and Gardel hung out together as Cuento del Tio artists, or shared detention centers..